If you’re looking for something to do today without spending any money, consider these alternate options. Just some simple ideas for ya! Some are fun and others are productive. Nothing fancy, just some ideas that came to mind. Here are 25 for you today, and I’ll post another 25 soon! 1. Go on a picnic with food you already have. 2. Call/Skype a long distance friend to catch up. 3. Visit a nursing home. 5. Mend that pile of clothes that needs mending. 7. Read a book you already have. Don’t have any good ones? Read them all already? Trade books with a friend or hit up your local library! 9. Experiment in the kitchen. Use what you have on hand and come up with a new recipe! 10. Invite friends over for a potluck. 11. Start a prayer journal. 12. Trade clothes with a friend. 13. Wash your car at home. 14. Go through your house to find stuff to sell on Craigslist or eBay. 15. Make a craft with materials you already have. 16. Go for a walk/run. 17. Organize cabinets, drawers, under the bed, etc. De-clutter all those places that seem to get so messy. 18. Window shop at different grocery stores, comparing prices on your usual buys. 20. Rent a DVD from the public library. 21. Look online for free events around town. 23. Go geocaching. Never heard of it? Click here. 25. Clean out your fridge. No matter how recently you cleaned it, it probably needs to be done again. 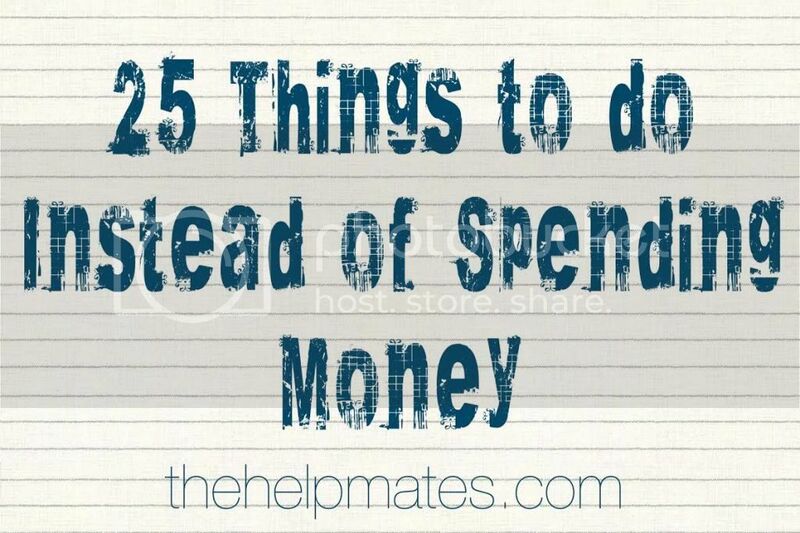 Look for my post on 25 more things to do instead of spending money soon! Brilliant! I can’t wait for your next post!